I’ve posted this picture before. Well … sort of . Hit the link above to see my original posting. Any changes? Well, I’ve tinkered with the text a little. Just a bit here and there, just to tidy it up. A bed and breakfast in York has requested a print of the sketch for one of there themed rooms, so I’ve polished the writing up a bit so it’s a bit more A2 print-worthy! Yes, you heard it here first … A2! Blimey! I’m used to seeing my little sketches in teeny tiny A5 sketchbooks. When I originally posted the sketch I can’t believe that I missed out the best bit! As usual before I started sketching I took a quick photo – using my iPad for a change. 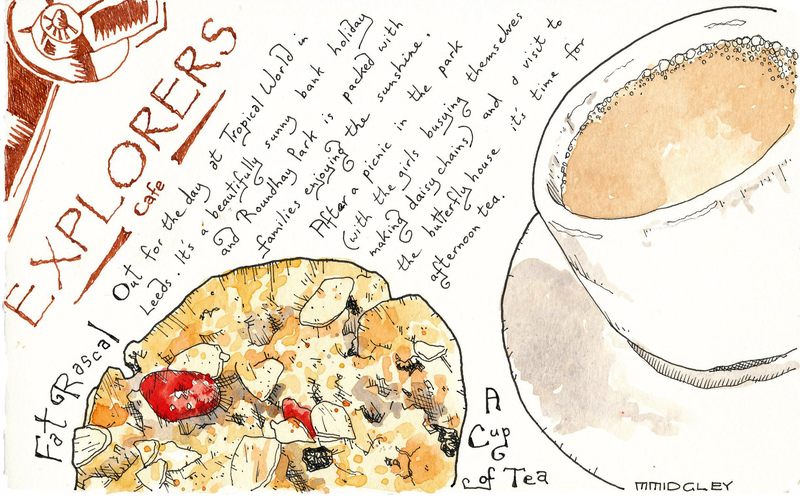 Sketched my Fat Rascal and cup of tea – then enjoyed them. By which time Caroline had finished her meeting and had come to join me for a second round of refreshing tea. and then we headed back to the car …. Reaching for iPad … I found that was super hot and the battery was down to a low percentage. Somehow it had been taking photos the whole time! From the point when my tea and cake arrived – through my sketching and relaxing, then sitting with Caroline chatting and the walk back to the car! I had about 3500 photos to delete on the way home! Each of the following photographs had several hundred examples. And while I can appreciate their, quite outstanding photographic excellence, it was a bit tedious scrolling down through hundreds of them! Now, I love my drawing bag as much as the next person but 3500 photos from the inside seemed a little extreme! 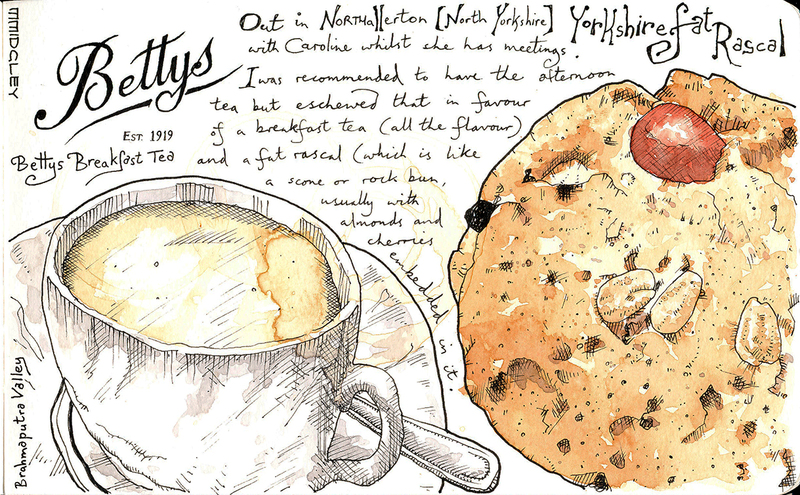 Established in 1919, Betty’s Tearoom is a bit of a Yorkshire landmark. For nearly a hundred years it has upheld the English tearoom traditions of elegance and manners amongst tea and buttered scones. Caroline had meetings to attend to in Northallerton and so I tagged along so I could visit a couple of tearooms (I managed to have Croque Madame again for my lunch at 1881 as well as having a leisurely tea at Bettys). It would have been lovely to have have taken in afternoon tea in such pleasant surroundings but my Croque Madame lunch was still lingering on my lips, so I settled for a Fat Rascal instead; a kind of large fruit scone, or rock cake, with a couple of cherries and almonds arranged on top. Served warm with lashings of butter to melt into the crumbs. Yum. We spent a lovely day out at Leeds’ Roundhay Park; a picnic lunch next to an ornamental pond, the tropical butterfly house and then we hung out in the park. It was such a pleasant, sunny day we had to indulge in ice-creams and play about with the frisbee.